Nixon Hire, one of the UK’s largest and leading site equipment providers, has extended their investments in their burgeoning temporary accommodation rental fleet. Following on from their recent purchase of our EasyCabin Ecostatic welfare units, the company has now completed a further order for the EasyCabin Exclusive Sleeper 20 temporary accommodation units. The EasyCabin Exclusive Sleeper 20 has been built with warmth and user comfort at the heart of its stylish design. 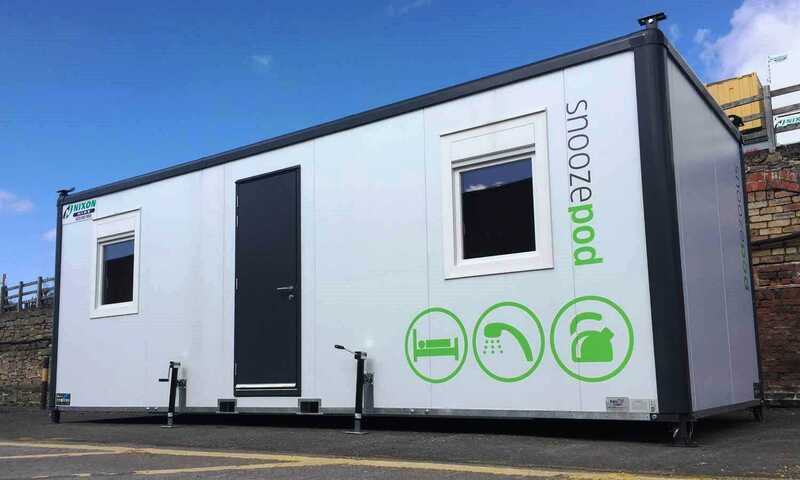 The Nixon Hire team will be showcasing this brand new unit, entitled the Snooze Pod, at the forthcoming Scot Plant outside exhibition this Friday 20th & Saturday 21st April at the Royal Highland Centre, Edinburgh. Visitors to stand 3 (9th Avenue) will be invited to evaluate all the new and privileged features and benefits of the Exclusive Sleeper 20. Scot Plant is said to be Scotland’s biggest construction equipment trade event. The living area comprises of 2 to 4 beds with reading lights, shelving, cupboards and a spacious wardrobe. Heating is via a 1.0kw plinth heater and lighting from energy saving LED lamps. Full kitchen facilities include: Sink, microwave, kettle, fridge, hob, extractor and refrigerator. AJC EasyCabin’s unique Ecosmart technology is built in to the Exclusive Sleeper 20 as standard. The Ecosmart system regulates the power usage of the generator, significantly reducing fuel consumption when compared to a standard unit with a continually running generator. Founded in 1967, Nixon Hire is a family-run business employing nearly 500 people across an ever-expanding depot network. With over 50 years of experience they supply plant equipment, tools, site accommodation, welfare facilities and portable toilet products alongside associated services. Nixon Hire currently has 13 depots in England and Scotland.